I just added an brief entry to the kWIQly resources page which will help anyone wanting to understand the basics of how direct compensation can be implemented mathematically. Do feel free to use it in energy management or building services course materials etc. However, more important for energy managers is knowing why and when to use compensation and more specifically its' superiot lesser known cousin, direct compensation. The emphasis of this post is not about how it works, but why, the particular benefits and pit-falls, and how you can improve on it. 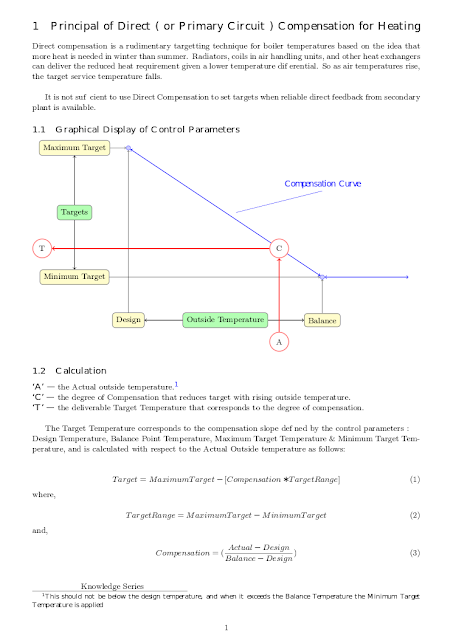 Compensation is a strategy to save energy in buildings and is a principle strategy widely used to define target flow temperatures for most Variable Temperature Zones that may support Fan-Coils, VAV units radiators etc. Note Thermostatic Radiator Valaves (TRV) are similar in concept but respond to local conditions not outside weather conditions. Simply put, compensation is about lowering supply temperature or zone flow temperature when less heat is needed because outside conditions are warm. It is a coarse rather than a perfect strategy, and may allow heat supply to surpass heat demand. Automated Temperature Setback is one technique to improve performance, but the result is again crude. DHW support (including legionella protection) - obviously hot water services are about provision of a certain amount of water at a specific temperature. Certainly in summer people prefer slightly lower hot water, but this should be controlled independent of any direct compensated heat source. Boilers that do not have economisers, or are not condensing boilers may be eroded by acidic flue gas condensates. The emphasis on protecting boilers is exaggerated, relative to the cost of plant replacement, because energy benefits may exceed the protection benefit. This is increasingly the case as few high sulphur content oils are now used for heating and so sulphuric acid production is limited, particularly with cleaner natural gas being used. Lower circulation temperatures at time of low energy demand mean reduced standing losses (which may drive chilling loads). Lower boiler return temperatures mean improved heat transfer (efficiency), lower boiler standing losses (as disabled boiler bodies cool), lower flue temperatures, and lower firing-frequencies (leading to lower energy losses in pre and post purges of the combustion chanber. Lower circulation temperatures mean that proportional control bandwidths are wide. This makes them easier to control within tighter comfort limits, generally better stability improves comfort and reduces chances of "load-galloping" in conjunction with response hysteresis and Integral windup problems. In conjunction with the comfort benefits of wider proportional bands, down-stream valve actuators are naturally exercised more widely reducing mechanical wear of valve shoes. As mentioned above, temperature compensation is a coarse tool. Essentially less heat in Summer and during the day because of diurnal variations. Humans used to live in caves! At night it gets colder and we lie down, we exercise less and we use our brains less (all of which reduce our rate of heat loss) so we are more comfortable at night in a cooler environment. This is an advantage- we can allow temperatures to fall slightly when the drivers of heat loss are at their worst. If you know the downstream valve positions of your plant, you can tell if the heat supplied is satisfying them. It obviously makes sense to match supply with real demand (as well as the plant reports it) and use this to fine-tune compensation. More on this when I get the chance (especially how to deliver to an established target efficiently). Six poor ways of finding waste and "Why?" Know waste, No nonsense, Know Now ! What promises do you keep ?